Valentine’s Day is kind of a crock, right? Listen. That’s not some jaded/single/lonely perspective. Though I am single. And truthfully, a little lonely. (Moving is hard.) But I’m not jaded. I love love (particularly more than LP or Stowe will ever love love). But Valentine’s Day is a bit of a crock. Why celebrate your love on just one day? Is your love so wimpy that it can be contained to just one day? And as someone on the internet said, in elementary school, the whole class was your Valentine. Why limit yourself to just one Valentine? 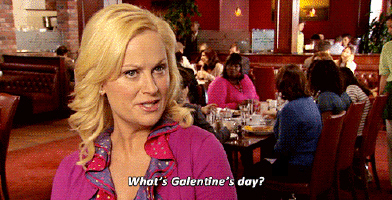 I’m a huge fan of the Galentine’s Day, made popular by my fictional best friend, Leslie Knope. A date with your best gal pals. Nothing bad about that! Only the best day of the year! But because moving is hard, I’m flying solo this Valentine’s Day. I saw this Bon Appetit article yesterday on what their staff is cooking this Valentine’s Day. I’ll be honest, they all sound delicious. Fancy steak? Manhattans? Mac and Cheese? Macaroni and cheese is my spirit animal. But this Valentine’s Day, I’m going to practice a little bit of self-love. Ew. Not like that, sickos. I’m going to make something that I love. Something special. A gift to myself. My most favorite food in the whole world is fried chicken. So, fry chicken I will. I’ve only ever done it once and it was only ok. But if at first you don’t succeed, try try again, right? I’ve got a few days to find the right recipe and the right accompaniments. Off the top of my head: mac and cheese, biscuits with honey butter, green beans. Accompanied by some bourbon. And some sort of dessert. But that’s just off the top of my head. Or whatever. Valentine’s Day might be a crock but I’m down to celebrate love and fried chicken. I’ll happily share the love. But I’m not going to share the fried chicken. As they always say, all is fair in love and chicken.